"Olin Tezcatlipoca organizer, historian, lecturer, poet, philosopher and founder and director of the Mexica Movement. Mexica Movement is a Nican Tlaca (Indigenous) rights educational organisation founded in Los Angeles, California in 1993 with members and supporters in several cities. His research-based reconstructed view of history and colonialism grew out of a need to solve the puzzle of standard Eurocentric-told history. His years of research eventually led him find that missing history that would unravel the lies of European-told history. It led him to develop an organisation with which to present that history." "This important discussion will highlight how the whitewashing of the continent Cemenahauc (‘Americans’) has hidden the truth about its ancient cities and civilisations. European colonialisation is put on trial. Was the notion of European racial superiority, "White" supremacy, initiated by the Papal Bulls of the mid-15th century? Did the corrupt aspects of European Christian morality make for the justification of the criminal and immoral aspects of the invasion, conquest, and the use of smallpox as a weapon of colonization? How will knowledge of history and clarity on identity unite the Nican Tlaca (indigenous peoples) against white supremacy?" Digital Audio Visual recordings of both of Olin Tezcatlipoca's contributions. 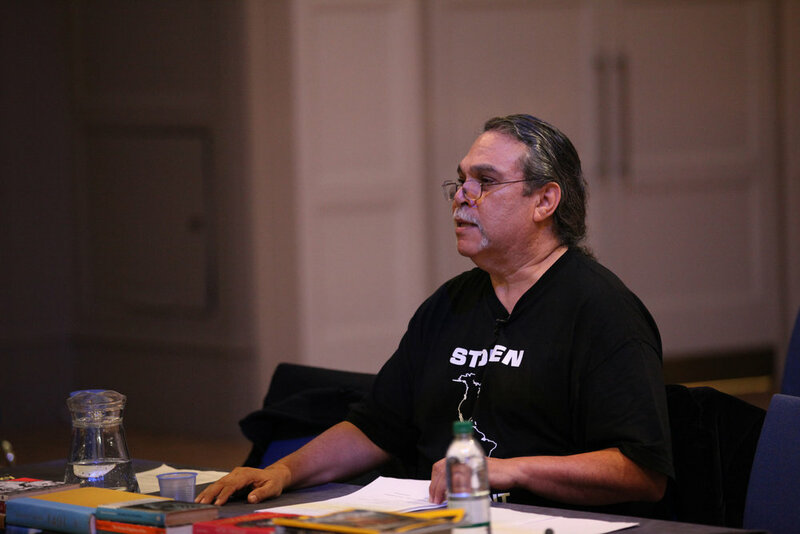 Photographs from Olin Tezcatlipoca's London visit.